Silentbloc style bushes for the base of the main front wingstay on the P, N and L Types. We understand that this steel outer and steel inner bush has not been reproduced since the 1930's and having reproduced the close tolerance outer diameter, they can simply be pressed into your old wingstays. 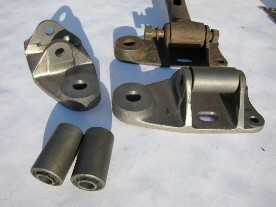 We also stock the main wingstay base plates.